In 1881, Union Pacific finally announced plans to construct a main line across Idaho toward the Pacific coast. Potential revenues in Idaho had not increased but a threat of competition from the west prompted the changed attitude. A new subsidiary, the Oregon Short Line Railway Company, was established to construct a broad gauge line from Granger, Wyoming through Idaho to a junction in Huntington, Oregon with the Oregon Railroad and Navigation Company. The proposed route would enter the Fort Hall Indian Reservation just west of Bancroft and pass through the Reservation in an east-west direction to the western border near Bannock Creek, west of Pocatello. 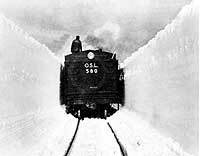 Tender on steam engine pushing Oregon Short Line snowplow on the Victor Branch, 1920s. Clifford Peake collection, Bannock County Historical Society Collection. The new road sought permission under the Fort Bridger Treaty for its right of way but it did not yet have sufficient corporate structure to handle the negotiations required with the Indians and the Federal government. Both Utah & Northern and Oregon Short Line were subsidiaries of Union Pacific so Utah & Northern was instructed to obtain the necessary right of way. The Act of Congress providing for Oregon Short Line did not mention the Fort Hall Indian Reservation either, but Utah & Northern did not raise any objection to the procedure and the terms of the Fort Bridger Treaty were complied with fully. The Railway Company sought a 100 foot wide right of way, with 20 acre station grounds approximately every 10 miles, except at Pocatello Junction, where it sought 200 additional feet of right of way and 40 acres for station grounds, totaling 772 acres. A gathering of the adult males on the Reservation agreed to the sale for $7.77 an acre, or $6,000.00. The Treaty was ratified by the Act of July 23, 1882, and shortly thereafter payment of this sum was made by Utah & Northern to the Treasurer of the United States on behalf of the Fort Hall Indians. On the next day, Utah & Northern transferred to Oregon Short Line all of its right, title and interest in the lands for $6,001.00. When the Oregon Short Line survey maps were prepared in 1881, there was no community named Pocatello. There had been a wagon freight station in the vicinity but no one lived in the area. Railroad records give no hint as to why the name Pocatello was selected, although it probably adopted the name of the freight station, named after Shoshoni Chief Pocatello, who lived in the general area. In the treaty negotiations the junction site was identified as "Pocatilla." The location map filed by Oregon Short Line identifies the location as "Pocatello Junction." However, there was at first no junction between the Oregon Short Line and the narrow gauge Utah & Northern Railway Company. This was built in 1882. Victor Branch, Oregon Short Line, about 1920. Two steam engines (one backwards) push rotary snow plow. The rear engine will pull the entire train out after the snow has been removed. Clifford Peake collection, Bannock County Historical Society. In 1859, Col. Frederick W. Lander reported the first meeting with Chief Po-ca-ta-ro or the "White Plume," an independent, aggressive leader of a band of Northwestern Shoshoni that ranged across the Hudspeth Cutoff and the Oregon-California Trails, from the Raft River on the west to Bannock Creek and the Portneuf River on the east (madsen, 1986). Pocatello was an important figure in the late 19th century, born in about 1815 in the Grouse Creek area of northwestern Utah, southwest of Oakley, Idaho. It was probably his band that made the attacks on wagon trains at Massacre Rocks in August 1862. The name Pocatello has no Indian significance and is apparently a phonetic attempt to express an Indian word. The Shoshoni language does not contain an "L" sound. The chief apparently referred to himself as "Tonaioza," meaning "Buffalo Robe." Other Indians had various names for him, but none was Pocatello. Apparently the name was a white man's label, without meaning. One cannot deny that the word has a nice ring to it. Many fables have been suggested for the meaning of the name but none has been established as authentic. Especially offensive is the suggestion that the Chief would beg for food in Pocatello, asking for "pork and tallow," which became corrupted into the name Pocatello. The suggestion has no basis in fact and is impossible since the Chief's name predated the settlement of the town. Furthermore it is (typically) demeaning and insulting to the Chief and the tribe. Some make the claim that Pocatello is the only town in the United States to have the name, whatever significance that may have. There are many towns which fit that condition. No doubt the residents of Pocatalico, West Virginia, make the same claim.